Bull markets are born on pessimism and die on euphoria. By that yardstick, the current bull market - already one of the longest on record – may have further to go. Many investors remain cautious and uncommitted; this has been one of the most miserable and loathed bull markets in memory. Yet, this feature helps to explain its remarkable longevity. Bull markets usually end only after the last buyers are flushed out, but there is abundant cash on the side-lines. So how does the last phase play out? We see two possibilities: the first is a classic boom and bust scenario that sees a final phase of irrational exuberance in equities, with disruptive technology as the new paradigmatic theme. The second is a more benign ‘sideways’ market - a period of consolidation that sees market levels drift, but with significant rating changes beneath the surface supplying opportunities for discriminating investors. The 99 months since March 2009 mark the second-longest bull market since the second World War. While we are not yet at the top, investors should start preparing for it happening in the next 12-18 months or sooner. Right now, however, equities remain the most attractive asset, as we are in a phase that is largely about being ‘braver for longer’, whilst balancing the risk of losses if timed incorrectly. 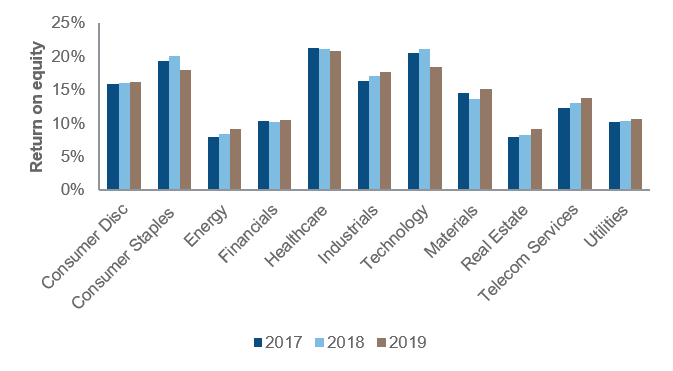 Business conditions remain favourable, which is allowing companies to grow their earnings and guide higher on future revenues. Better earnings can underpin high single-digit total returns, but we also need to see volatility stay low. If volatility was to become elevated, then such returns would not be sufficient to justify the risk. That said, there appears to be little pressure to stop this current bull market at present. 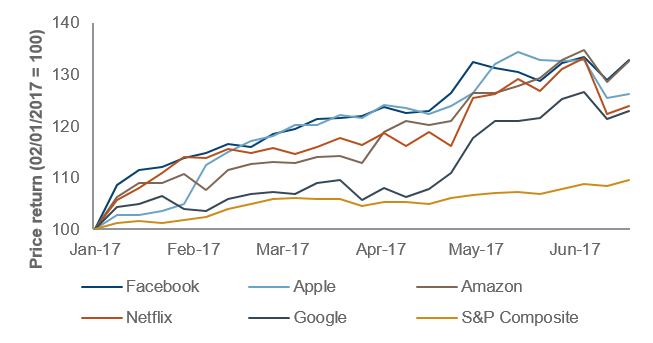 Market leadership in the US has narrowed somewhat, with the FAANG stocks (Facebook, Apple, Amazon, Netflix and Google) responsible for a significant proportion of total index gains. If the FAANG stocks can keep beating earnings estimates it will nevertheless support the US equity market. If growth were to pick up again, market leadership could broaden, but a continuation of the current conditions - with worries over tighter monetary policy - would most likely see the premium on growth stocks remain in place. Europe is at an earlier phase of recovery than the US. Companies generally have less pricing power but now that inflation is picking up, they will benefit from higher operational leverage. 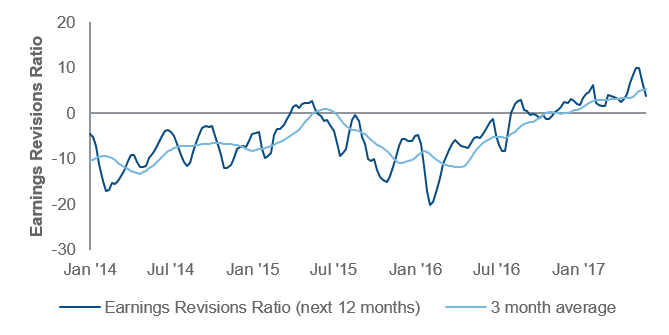 European earnings revisions have turned firmly positive - in fact, they haven’t been this positive in five years; earnings growth and revenue estimates are now outpacing the US. The Australian stock market has been one of the best performing market in the world over the long term, driven by the country’s strong population growth, an excellent and low cost natural resource base, a strong corporate governance environment, a high dividend yield and high real dividend growth. These key fundamentals are expected to continue driving growth in Q3. We remain positive on Chinese internet stocks, which are undergoing remarkable growth. Alibaba is forecasting revenue growth of 49% this year (exceeding analyst estimates by 10%). The shift to online is happening at a rapid rate in China and companies like Alibaba and Tencent are innovating at a frenetic pace, embracing new technologies like artificial intelligence. Their ability to target consumers using algorithms is driving strong growth in advertising spend. Both companies are also investing in cloud technology and the significant mobile payments market. We remain positive on technology stocks due to high levels of industry innovation, primarily structural growth drivers like cloud computing and the digitisation of previously manual systems processes. We are also positive on global telecoms, largely as a function of our positive views on the three most attractive national telecoms markets (Korea, Japan and the US) where there is strong pricing power. Wireless operators in these markets have been able to monetise data unlike in Europe, where there is little pricing power. We continue to like healthcare overall, although within the sector, many of our managers now favour medical equipment makers, over pharmaceutical and biotechnology companies. General commentary on market activity, sector trends or other broad-based economic or political condition should not be taken as investment advice. References to specific securities should not be taken as recommendations. This article is intended for use by adviser s and wholesale investors. Retail investors should not rely on any information in this document without first seeking advice from their financial adviser. In Australia, this document is issued by FIL Responsible Entity (Australia) Limited ABN 33 148 059 009, AFSL No. 409340 (“Fidelity Australia”). Details of Fidelity Australia’s provision of financial services to retail clients are set out in our Financial Services Guide, a copy of which can be downloaded from our website.